Under ArmourThe Under Armour Hovr Phantom. Under Armour has released a new shoe platform known as Hovr, and two new shoes are built on it. The release was splashy, consisting of events around the globe and deliveries in Rolls-Royce Phantoms. It could be a catalyst to “reignite” the brand’s footwear business. Under Armour is pinning its footwear hopes on a brand-new shoe. A new, proprietary foam sole platform known as Hovr is behind it. The company says the new foam has an “energy web” that provides both a “zero-gravity feel” (hence the name) and energy return for runners. The shoe comes in two models: one focused on comfort and lifestyle, called the Phantom, and one focused on speed and distance, called the Sonic. The Sonic is $US100, while the Phantom is $US130. 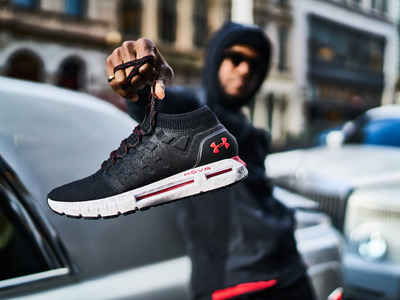 Connected models that sync with Under Armour’s MapMyRun app are available for an extra $US10. The global release of the Hovr shoes was somewhat flashy compared to Under Armour’s previous events. It was released globally on February 1 – the first time it launched a product around the world at the same time. The campaign for the shoe was was the biggest and most expensive marketing campaign for a product the brand has ever done, Adrienne Lofton, Under Armour’s senior vice president of global brand management, told Fast Company. Under Armour even delivered the shoe to some influencers in flashy white Rolls-Royce Phantoms. Under ArmourThe Phantom (left) and Sonic (right). The shoes are already getting buzz, and some models have sold out on Under Armour’s website. Under Armour has already indicated that the Hovr platform will not stay in the Phantom and Sonic, and will expand to other shoes in future seasons. The company has previously stated that it sees an opportunity in running shoes. Under Armour may be trying to capture the success Adidas has seen with its popular Boost sole. Even Nike has recently attempted to copy Adidas with a foam sole of its own, called Nike React. 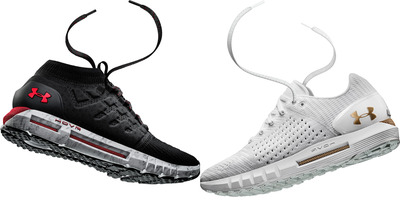 All three of these shoes fall into the “lifestyle running” shoe category, a dominant force in sneakers and footwear right now. Under Armour’s previous shoe offerings focused on basketball, which is currently not moving the numbers it once did.